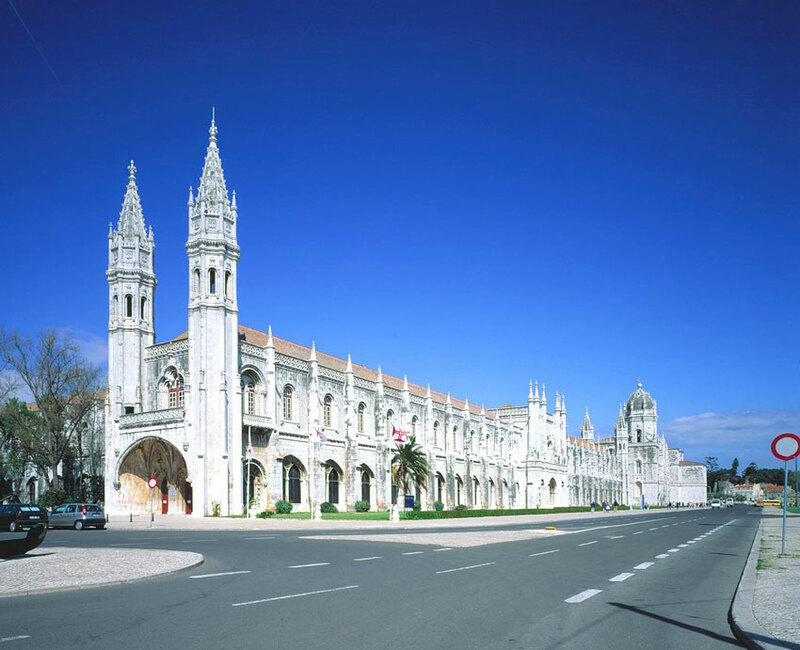 Lisbon is one of the most immediately likeable capitals in Europe. Located on the westernmost front of Continental Europe, its mosaic of terracotta roofed buildings cling both majestically and humbly to its seven hills. The Tejo River sweeps past the many character-rich districts which border it, carrying boats big and small and is straddled by two impressive bridges. Some ultra modern skyscrapers rise starkly out of the generally more low rise and higgledy-piggledy layout of buildings, reminding us that Lisboa is indeed a modern city. 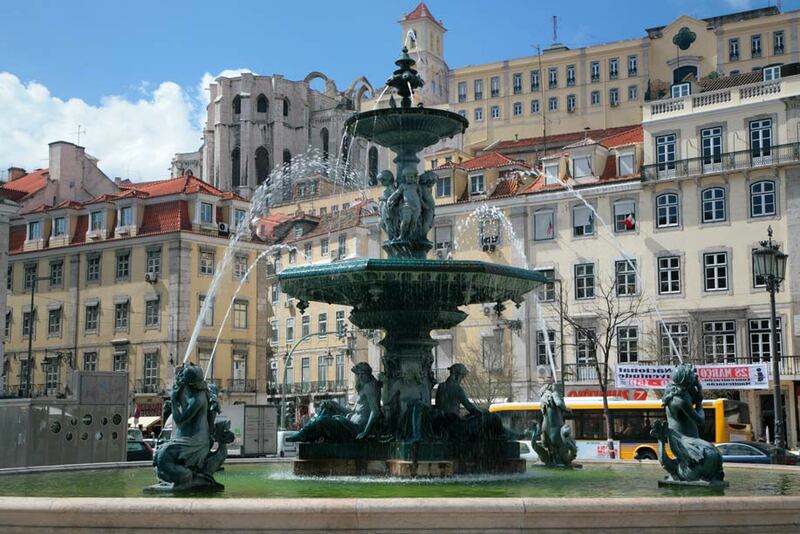 However, what makes it attractive is the fact that, despite being very much a multicultural 21st century metropolis, Lisbon retains a foot in the past and a remarkably provincial feel. Small markets still abound, frequented by traditionally dressed women bearing their load on their head, wood-interiored trams still rattle up unfeasibly steep slopes and people from all walks of life chatter in unpretentious local bars and cafes. In 1755 a massive earthquake, and subsequent tidal wave and fire, killed 40,000 and completely destroyed much of the lower central districts occasioning its rebuilding under the wise instruction of the then prime minister the Marquês de Pombal. Although considered wildly over the top in an era with few motor vehicles, his visionary plans are responsible for the broad avenues that carry today’s heavy traffic up through the city and the grid-like layout of the Baixa. The statue of this revered man gazes down at his remarkable work from a column, high above the square bearing his name in the centre of the city: now a very busy roundabout. Some districts survived the devastation of the earthquake and retain their medieval and sometimes even Moorish structure, notable Alfama. This district, the oldest in Lisbon and crowned with the Castle of St Jorge, is somewhat like a village within a city with labyrinthine streets inaccessible to cars, tiny grocer’s shops selling the bare essentials and people who really know each other despite living in the centre of a modern capital. At the foot of this hill inland is another of the older quarters, Mouraria where nowadays traditional and modern multicultural Lisbon live side by side, its now predominantly African and Asian market still a hub of activity. On the opposite hill another old district, Bairro Alto, bustles ceaselessly. By day it is a well-worn, residential area with butchers, bakers and washing hanging from low wrought iron balconies of its traditional houses. However, at nightfall it transforms into a veritable maze of bars and restaurants of all shapes and sizes, and every night of the week revellers fill the streets until the early hours. 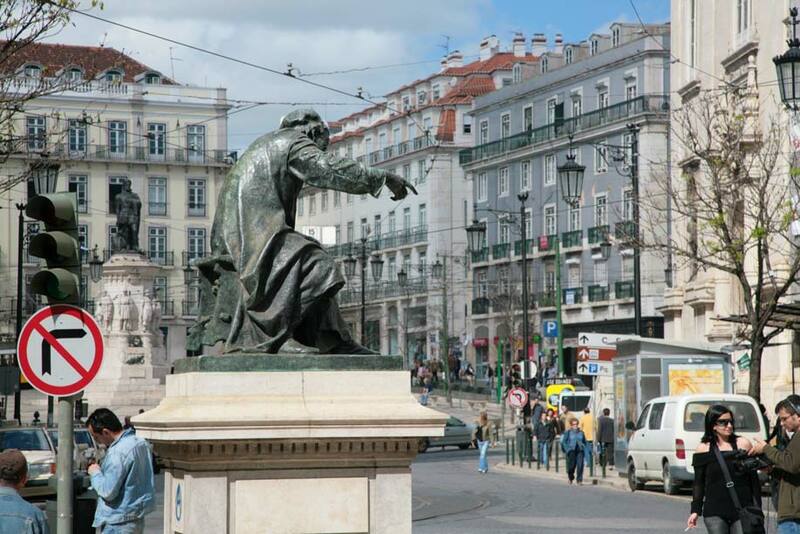 In the gorge separating these two mounts, we find the opulent squares and straight streets of the Baixa. Grand theatres, majestic fountains and statues complement the array of well-presented stores and upmarket cafeterias. 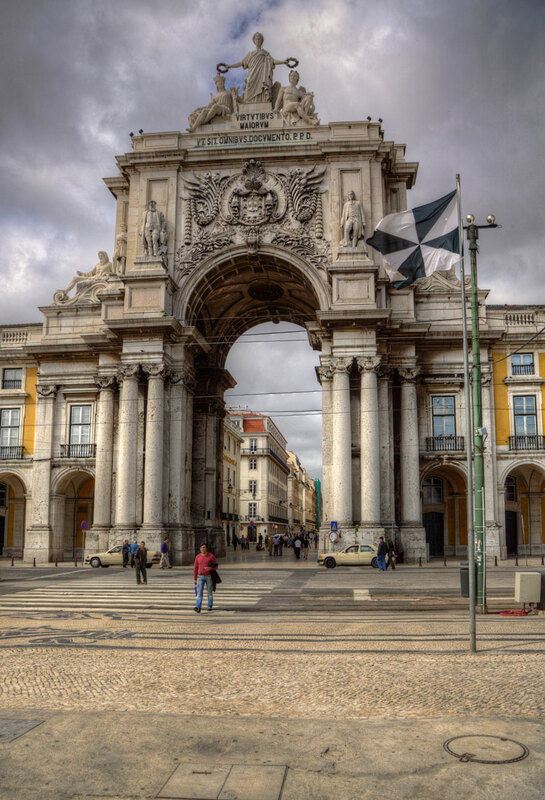 The main shopping street, the Rua Augusta, leads straight down, through a sumptuously ornate archway to the monumental square, the Praca do Comercio and the river. Linking this lower zone to Bairro Alto is the traditional shopping area of the city, Chiado. Almost pedestrian, this is a pleasant place to browse or take a coffee. The fine examples of old-fashioned shops and cafes, alongside international clothes stores and the recently refurbished Armazens de Chiado shopping centre, serve to enhance the experience. Heading further up through the central avenues of the city we find the district of Saldanha with its stylish high-rise shopping and cinema complexes, the long stretches of road-flanked gardens which link Campo Pequeno and its eye-catching red-stoned bullring to Campo Grande where the new Sporting Lisboa football stadium stands proud, passing in between the fairground attractions of the Feira Popular. Following the course of the river towards the Atlantic from the Baixa there are plentiful other interesting quarters. Located under one end of what is now an internationally recognised symbol of the city, the glorious red suspension bridge, is the traditional dockside district of Alcantara. The docks are still busy, though the lively new bars and clubs here are what attract most people. Keeping a watchful eye from the hill behind is a cypress lined cemetery of Prazeres and the predominantly residential districts of Campo Ourique, Estrela, with its basilica and peaceful gardens, and the elegant, embassy rich Lapa. Further still lie the many wonders of Belem – a ‘must see’ on every tourist’s itinerary. Here riverside walks take the visitor from monastery to international art exhibition, from botanical gardens to planetarium without forgetting the abundant and remarkable historical monuments and, of course, the speciality cake. Lying upstream from the centre is the airport and also the expanse of dockland which, in 1998, was transformed into the Expo site. Paved river walks, gardens, enormous concert halls, restaurants and an impressive oceanarium were all built to house the maritime-themed grand exhibition that year. Today named the Parque das Nacoes (Nations Park), it is a symbol of successful long-term planning in that it continues to serve the community of Lisbon as well as tourists providing a decent day out, extensive shopping and dining possibilities, regular concerts and exhibitions and desirable housing for those who can afford it. 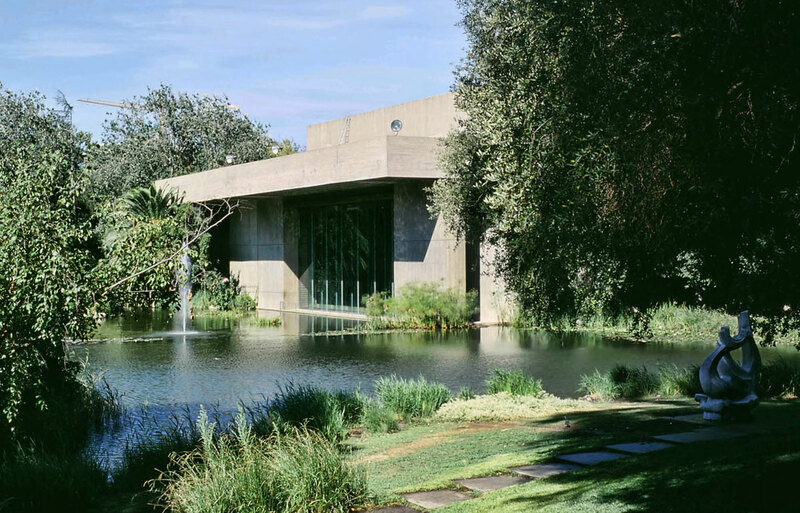 Other areas worthy of a mention include Praça Espanha, where the Gulbenkian Foundation art collection resides in two buildings with pretty gardens. Visible from many parts of the city are the three modern towers of the Amoreiras shopping centre, cinema and office complex, which lie near to the end of the impressive aqueduct which boasts the widest stone arch in the world. A short metro journey out of the centre is the Jardim Zoologico offering, amongst other things, a cable car ride above the zoo and a variety of animal shows and a few stops along the same metro line is the world famous Estadio da Luz, home to Benfica football club. 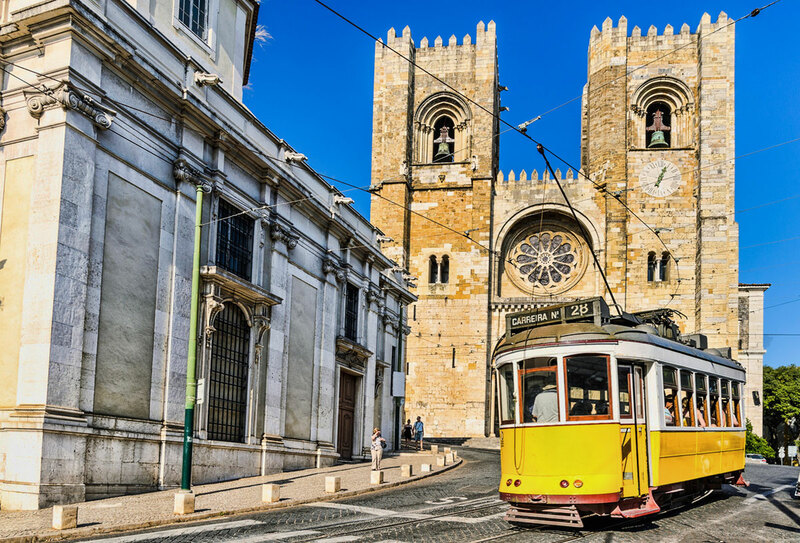 Lisbon’s relatively compact centre and variety of efficient urban transport make it highly accessible to the visitor, although pushchairs and wheelchairs can struggle with the narrow cobbled pavements which are often parked on by cars. Almost every area of tourist interest is served by the speedy and clean metro system, trams old and new work alongside an army of buses and the three main suburban train lines (towards Expo, Sintra and Cascais) run with impressive efficiency. Travel cards combining some or all of these options are available. Also deserving of a mention here are the three funicular tramcars which continue to carry people up the more daunting hills of Lisboa. Known as elevadores, Bica and Gloria serve the Bairro Alto community and Lavra climbs the opposite hill. Alternatively, taxis, although chiefly sumptuous beige Mercedes, are not the luxury they are in other capitals and journeys across the centre of the city won’t break the bank, especially if you’re not alone. For those wishing to cross the river, ferries run from various places along the river although getting to the various beach resorts from the ferry terminal involves another bus journey. Some buses take you across the bridge straight to Costa da Caparica for example.